Our neck must support our head, itself about a tenth of our overall body weight. It must also though, be flexible, and our quite amazing flexibility has been achieved by compromising somewhat on strength. The neck muscles are also at the mercy of our emotional state. All in all, neck pain is thus a common reason for seeking treatment. Indeed it now represents the fourth largest cause of disability worldwide (1), and is the second most common musculoskeletal condition treated by professional acupuncturists in the UK (2). My own experience is that acupuncture can be of significant help, particularly as Chinese medicine readily recognises and deals with, any emotional factors which are affecting the physical body. The first distinction I need to make when you seek acupuncture for neck pain, is whether the problem is chronic or acute. Taking chronic cases first, these will have persisted for months or years, and may be due to long-term postural problems, occupational factors, old untreated injuries such as whiplash, or degenerative conditions such as osteoarthritis. They may be accompanied by restrictions in your range of movement, making reversing a car difficult. There may be headaches, pain referred to the shoulders or arms, or sensations such as pins and needles in your fingers. A comfortable sleeping position can be hard to find, and if you have been lucky enough to find just the right pillow, then you will be keen not to part with it! I will interview you so that we can together establish all the finer details of these and any other symptoms. Treatment is usually weekly for a few sessions, with the aim of reaching a more comfortable and settled state, before we start to space the appointments out more. If a degenerative condition has been at work for some time, then although treatment is unable to reverse changes which have already taken place, it may however, slow the rate of further deterioration, and leave you feeling that the condition is less burdensome. Turning to acute neck problems, these have often arisen in the 24 to 48 hour period prior to someone contacting me: perhaps they may have slept in the wrong position, or suffered whiplash, and found that their neck starts to seize up, and is painful when turning the head to look over the shoulder. I find these patients benefit significantly from one or two treatments spread over just a few days. Some of these patients will report that this is a problem which flares up every few months, perhaps triggered by stress, getting angry, being exposed to a cold wind, or even sleeping in a draught; if this is the case, we need to look more closely at how these relapses might be avoided. Whatever the type of neck problem, you can expect me to take a look at your posture, check your range of movement, get to understand any occupational factors, examine also your upper back and shoulders, and discuss your health in the widest sense. 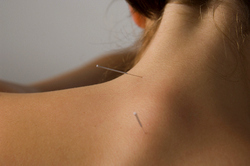 My preferred treatment is frequently a combination of acupuncture, massage and lifestyle advice. I might give you some stretches or Chinese qi gong exercises to practise. You will also notice I am very keen on keeping the neck warm and protected from the elements, so if you do not already do so, start wearing a scarf whenever you are out in cold or windy weather. If you would like to discuss your particular symptoms in more detail, you are always welcome to call me. (1) The global burden of neck pain: estimates from the Global Burden of Disease 2010 study. Annals of the Rheumatic Diseases, July 2014. (2) Acupuncture in practice: mapping the providers, the patients and the settings in a national cross-sectional survey. BMJ Open, January 2012.